Bring home the BBQ! 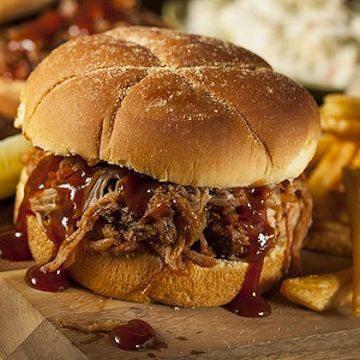 Sweet Hickory BBQ sauce poured generously over lean, tender, pulled pork gives you the perfect fixin's for absolutely incredible sandwiches. Simply pick your favorite kind of bun and microwave the fully cooked pork. Serve with our Steakhouse Fries and you have a quick, easy and delicious meal!. Meal serves 4. Stove Top (From Thawed): Remove thawed pulled pork from packaging and place in saucepan. Heat over medium heat while stirring constantly for 5-6 minutes.�Microwave (From Frozen): (1100 watt with turntable): Place covered tray of pulled pork in microwave and heat on HIGH for 6-8 minutes. Let stand 1-2 minutes. Carefully peel back film. Stir well and serve. Ingredients: Pork (Seasoned with Water, Sugar, Salt, Sodium Phosphates. Rubbed with Brown Sugar, Salt, Flavoring (Hydrolyzed Soy Protein, Hydrolyzed Corn Gluten, Caramel Color), Molasses Powder (Molasses, Wheat Starch, Soy Flour), Spices, Onion Powder, Garlic Powder, Soybean Oil, Oleoresin Of Paprika, Spice Extractives), Barbeque Sauce (High Fructose Corn Syrup, Tomato Paste, Water, Distilled Vinegar, Pineapple Concentrate, Molasses, Salt, Honey, Soybean Oil, Spices, Onion Powder, Garlic Powder, Caramel Color, Mustard Bran, Natural Smoke Flavor, Celery Seed, Extractive of Garlic). Contains: Soybean and Wheat.